When I was thinking of what to write this evening, as I just begin decorating the house outside and in, the thought of what I like to have as a backdrop for my decorating (however late) came to mind. Whether I'm getting out the orange stands of lights, fog machine or tombstones, I have some essential needs for a soundtrack: horror movies. And not just any horror movies-- for this ghost, having John Carpenter's "Halloween" playing on the TV, followed by something older, something black and white and flickering like Bela Lugosi in "Dracula" is called for. And these are just two of many which will do. No matter how many times sequels, remakes or re-imaginings are made of "Halloween," film will never achieve, in my humble opinion, the October orange effect of Jamie Lee Curtis' Laurie Strode walking the autumn streets of Haddonfield with a pumpkin, to Carpenter's genius score. 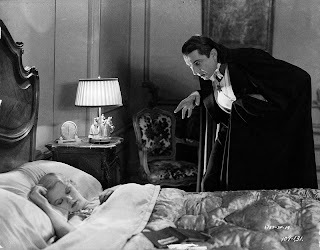 And no matter how often the character of Count Dracula graces the silver screen, films like Lugosi's will always carry a dreamy, nightmarish authority that I've always found something of a comfort in. These films, seen so many times, remain vibrant and needed for the season-- even if only in the background as we begin to decorate, or fall asleep to at night.